"What a roller coaster of emotions it has been this last week. Frankie is our 2.5 year old tabby with absolute personality who disappeared unexpectedly on Sunday 13th May. He and his brother Leo have been a part of our family since they were 10 weeks old. We couldn’t resist them both at SPCA and had to get both of them. Frankie has real character and to get our attention he would try to trick us into thinking he was hungry again. He would jump onto the bench look at us and then push something off all the while getting our attention as if to say “come on feed me will you” We missed that so much even though at times it got annoying. Every time we drove home we would be wondering if he would be home, every time we fed Leo we would wonder if he come from around the corner and be there too but he wasn’t. Our home wasn’t the same without Frankie. I would call him every night and every morning to see if he would come. Sometimes wondering if he would ever come back. We shared the Lost Pet Finders post on our local facebook pages and got lots of well wishes, we knew people would let us know if they saw him. 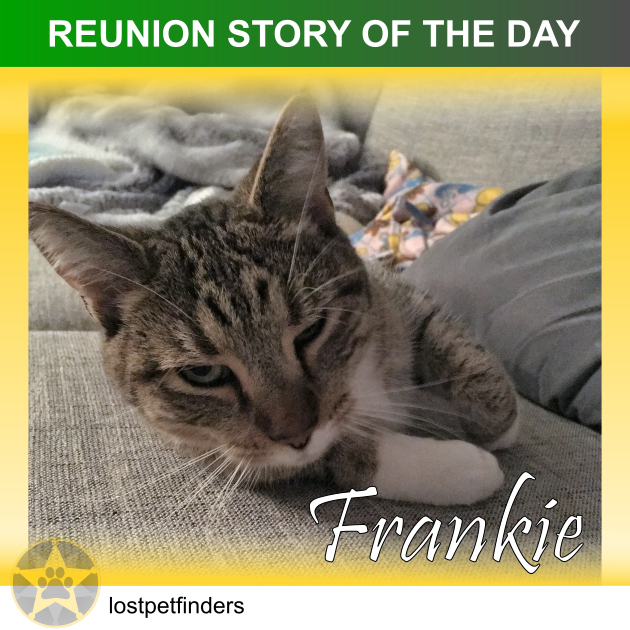 One person resent us a post which looked so much like Frankie but sadly wasn’t. We all missed him so much. We prayed every night that he would come home, but he didn’t not till early Saturday 19th May he bounded through our cat door into our bedroom and meowed very loudly. I said to my husband rather loudly thats Frankie he said “No its not thats Leo” i was sure it was Frankie and so turned my torch on from my phone and sure enough it was Frankie wanting food and lots of attention at 1:15am. His pads were very red but after food & sleep he has settled back into our family. Ours prayers were indeed answered.